By far the most important tool I have used to help me lose weight or maintain my weight is MyFitnessPal. This is the most popular calorie counting app available for both iOS and Android phones. MyFitnessPal has a large user community and is compatible with a wide variety of fitness trackers and other mobile fitness apps. The MyFitnessPal community can also be helpful and motivating. Just reading how others are doing, their questions, their victories, their struggles, etc., helps me stay on course because it is so very easy to drift off and lose sight of your goal without the help and guidance of others. It’s also nice to help and guide others too! I also know that losing weight is far more about how many calories I consume daily than physical activity. Actually, I lose weight more quickly when I just cut back on the calories and don’t workout at all but that’s not the healthiest thing to do. Who wants to be a skinny person with a terrible cardiovascular system and no strength or endurance? Not me. 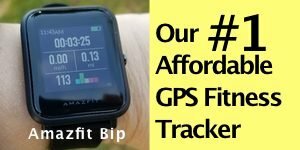 Since I review a number of fitness trackers, and there’s usually a different one on my wrist every week, I’ve noticed that it has become really hard for me to remain at a healthy weight. I’ve gained some weight back even though I’m physically active. 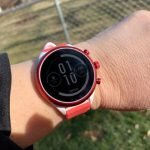 So, even though I might have a different fitness tracker on one of my wrist every week, the Gear Sport will be on the other most of the time. Why? 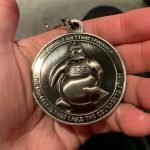 I thought about how I was able to lose over 50 pounds three years ago and why now I’m barely able to maintain my weight and realized what I did different then. 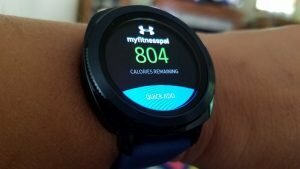 The most important thing I did was log every single calorie in MyFitnessPal AND use it along with the Samsung Gear Fit 2 (links to Amazon) to help me keep track of my workouts and encourage me to workout every day. Being able to see how many calories I was burning was very motivational and it also made that 1200 calorie-a-day goal workable. By working out, I could add 200-300 calories extra to that 1200 calorie goal and eat closer to 1400-1500 calories which is much more practical. It doesn’t take long to eat 1200 calories, believe me. As long as I burned off enough calories to get me back down to 1200, I lost weight on a weekly basis. Of course, this requires careful tracking of both food calories and burned calories. 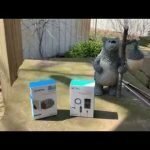 Now, three years later, I have the Samsung Gear Sport (View the Gear Sport on Amazon | Compare price of the Gear Sport on Walmart) and it’s even more capable and accurate than the Gear Fit 2 was then (actually I started with the original Gear Fit) and since I’ve gone back to wearing the Gear Sport daily, I’m not struggling nearly as much keeping track of both my physical activities and foods I eat because MyFitnessPal, the Gear Sport, and my phone all work together to help me stay on track. Once you have Samsung Health and MyFitnessPal installed on your phone, open MyFitnessPal and go to Apps & Devices in the menu. Samsung Health should show up as an option to connect to. Select it and then hit connect. 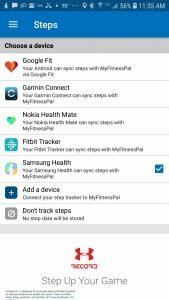 Now you need to make sure that you set the permissions correctly to have data in Samsung Health sent to MyFitnessPal. Open the Samsung Health app and then click on the 3 dots in the upper righthand corner and select Partner Apps. If you have connected with MyFitnessPal and should show up as an option. Select MyFitnessPal and enable the data you went sent to MFP. 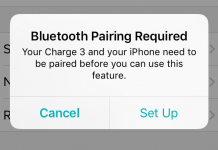 Now they should be syncing together and calories added through either app should show up on the other. 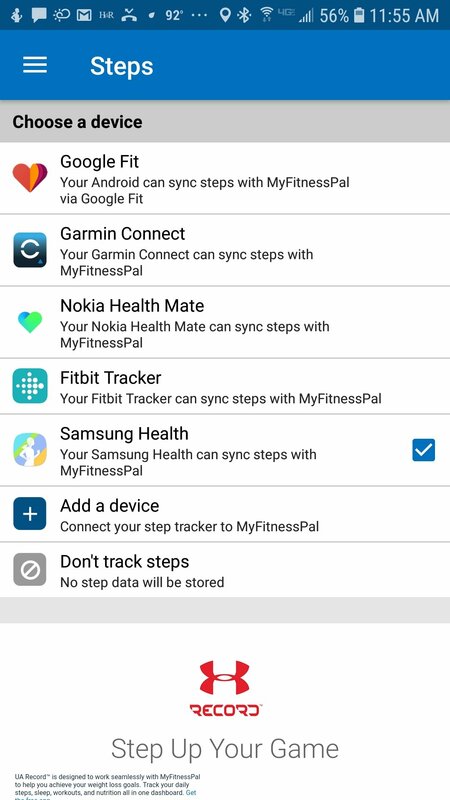 To have your steps sync with MyFitness, open the MyFitnessPal app and select Steps from the main menu. Check next to Samsung Health as the app or device you want to use for your step trackin. Now both your workouts and your steps should sync over from the Gear Sport, Gear Fit 2 Pro, etc., to MyFitnessPal and you’ll earn back some calories with those steps. Nothing encourages me to walk more than knowing I can eat a little more from those steps but be careful about that… I typically use my step calories as my insurance calories in case I was off on my calorie estimates. If anything, we usually undercount calories in the foods we eat instead of overcount, unfortunately. Instead, I pay a lot more attention to my more intense workouts and the calories I gain back from them. You’ll probably have to figure out what works best for you whether you’re able to eat back those calories or not and still lose weight, if losing weight is your goal. I also highly recommend a food scale to weigh foods to get a much more accurate calorie estimate but that’ll probably be a whole other article. A food scale I’ll soon be reviewing is from Greater Goods on Amazon. 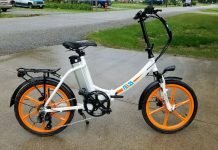 This one has all the bells and whistles but there’s cheaper ones that’ll get the job done too. When I first began weighing my food it was an eye-opening experience to learn how many calories were in the foods I was eating. I really had no idea before. 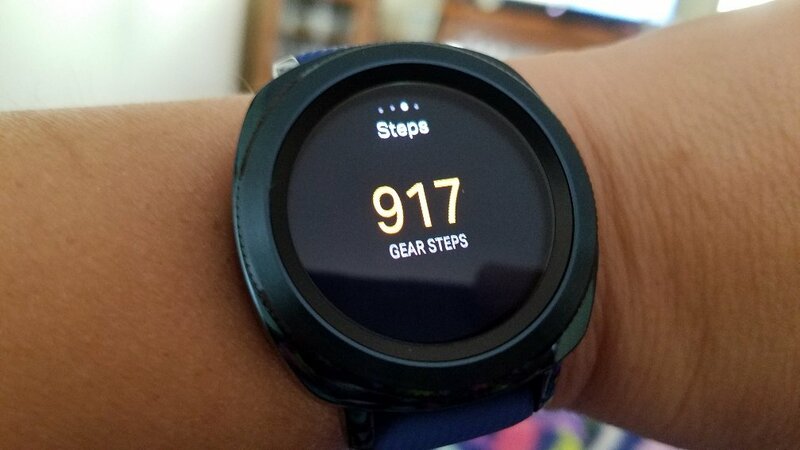 Something I particularly like about using the Gear Sport and Samsung Health on my phone for step tracking is that when I’m at the grocery store pushing a cart, or I’m pushing my grandson in his stroller, as long as my phone is in my pocket, I still get credited those steps. 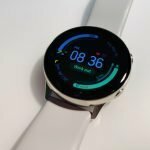 The Gear Sport, like other fitness trackers, won’t be able to detect steps when your arm isn’t swinging back and forth, as it does when you walk but your phone counts steps based on vibration from walking. This is a nice feature and you don’t have to worry about steps being double counted. 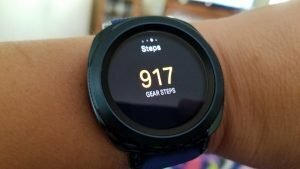 If you’re walking and your Gear Sport is counting your steps and you have your phone on you, only the steps from the Gear Sport will be counted. This feature works with any Samsung fitness tracker, not just the Gear Sport. 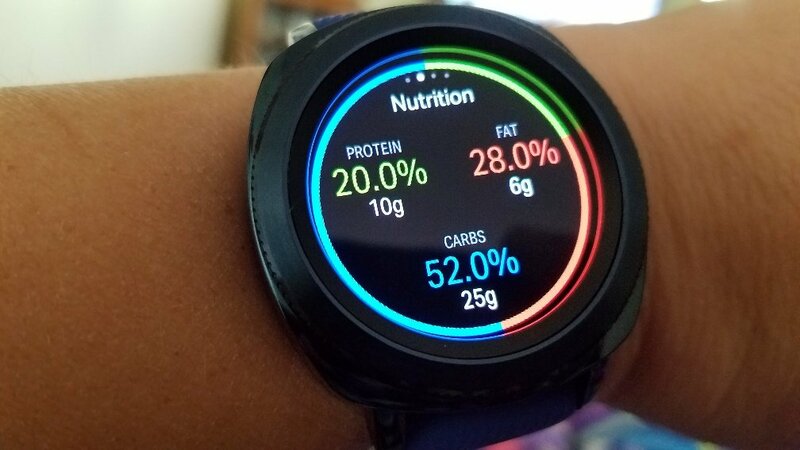 This is also available on the Gear Fit 2, but MyFitnessPal is available to install directly on your Samsung Gear Sport through the Samsung Gear app, NOT the Samsung Health app but the Gear app. 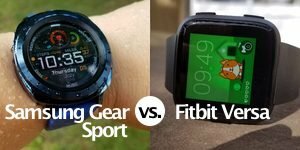 The Samsung Gear app is where you connect your Gear Sport (or whatever Samsung smartwatch or fitness tracker you’re using) to your phone. Firmware updates are downloaded through it and it’s also where you can download apps and watch faces. 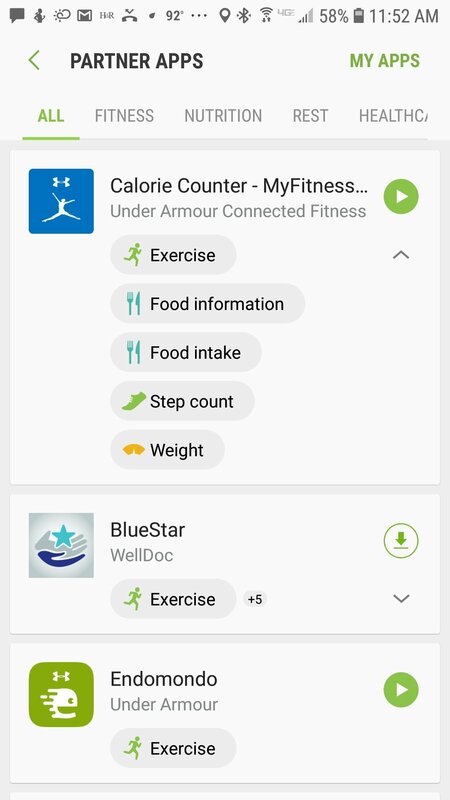 While in the Gear app, search for MyFitnessPal and install it. 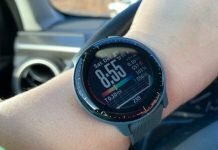 With the Gear Sport (and other Samsung fitness trackers), you also get 12 months free of the MyFitnessPal premium version which is a great deal. Once MyFitnessPal is installed on your watch, you can then add it as an easily accessible widget. 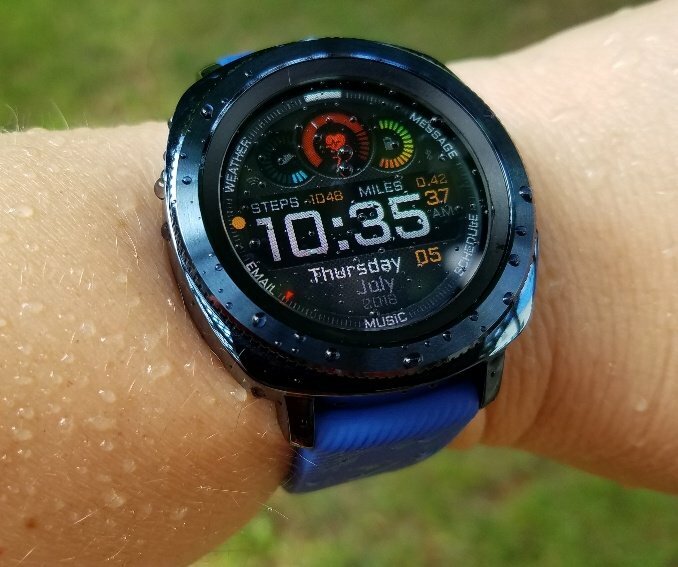 Scroll through your available widgets by swiping to the left or using the rotating bezel clockwise on the Gear Sport and until you get to the screen that says Add widget. 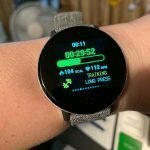 Click the plus button and MyFitnessPal should be an option, as well as any other apps installed on the watch that have available widgets. 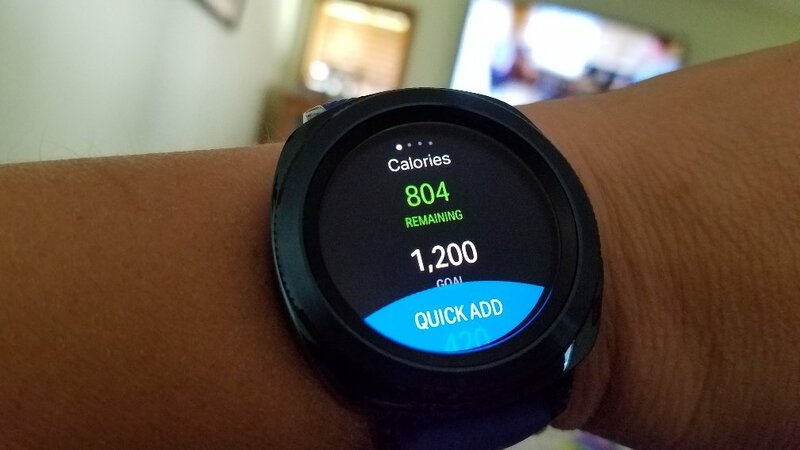 Now you’ll be able to see how many calories you have remaining, steps that have been synced to MFP, macro nutrients unless you have just used quick add, and the ability to add calories through the watch to sync to MFP. 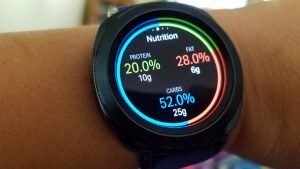 Unfortunately, you can’t search for specific foods through MFP and see their calorie and nutrient content on your watch but you can add quick calories if you know how many calories you have eaten. Using all of these tools together helps me stay on track better. Again, for weight loss, nothing is more important than keeping track of how many calories you are consuming daily and how many your should consume if you want to lose weight. Like they always say, you can’t out exercise a bad diet. Believe me, I’ve tried! Hopefully, these tips help and of course, MyFitnessPal syncs to other fitness trackers besides Samsung but in my experience, especially since I have a Samsung phone, Samsung fitness trackers work best for me for the reasons I stated above. Everything works so well together.